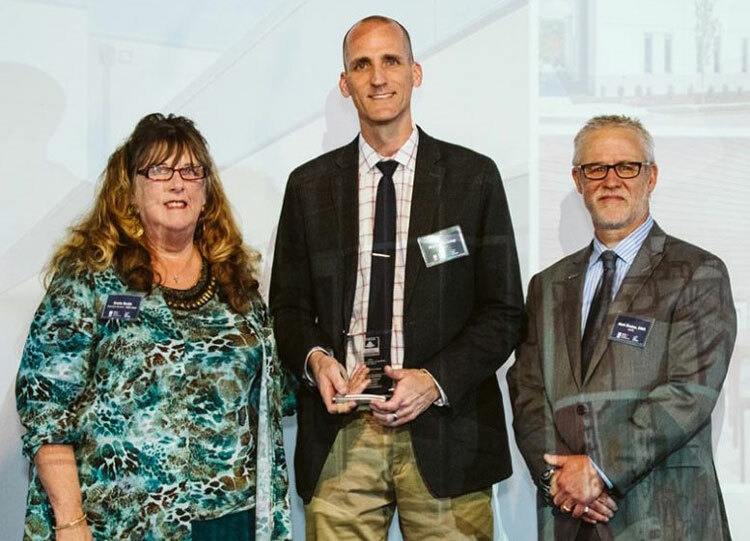 KAI Director of Design-Build Marcus Moomey (center) receives the DBIA-MAR 2018 Honor Award on behalf of the design-build team on the Deaconess Center for Child Well-Being project. St. Louis — KAI Design & Build’s design-build team received a Design-Build Institute of America – Mid-America Region (DBIA-MAR) 2018 Honor Award in the Commercial-Office Buildings category for the Deaconess Center for Child Well-Being in St. Louis. For more than 18 years, the DBIA-MAR has recognized excellence in design-build practices and informed the public of the breadth and value of design-build delivery through its annual awards program. An event honoring this year’s award winners was held on Nov. 15 in Kansas City, Mo. The Deaconess Center is the Foundation’s first new construction in almost two decades. The design and construction of the building reflects Deaconess’ religious legacy as well as its commitment to social causes by exceeding the city’s business diversity participation goals. The project achieved 36 percent Minority Business Enterprises (MBE) and 3 percent Women Owned Business Enterprises (WBE) participation. Elizabeth Noonan, an economic development professional and United Church of Christ member, served as the Project Manager, and minority-owned Kwame Building Group was the Construction Manager. With input from their talented subcontractors and with an eye on the project schedule, budget and desired level of quality, KAI’s team selected tilt-up concrete construction for the building’s exterior façade. Additionally, the team used vibrated aggregate piers to improve the urban soils and drastically reduce the owner’s site remediation cost and associated schedule impact.